EC stands for Electronically Commutated, and it combines AC and DC voltages bringing the best of both worlds. The motor runs on a DC voltage, but with a single phase 230VAC or three phase 400VAC supply. The motor incorporates voltage transformation within the motor. The non-rotating part of the motor (stator) is extended to make room for an electronic PCBoard which includes power transformation AC to DC, as well as the controls. An EC motor (Electronically Commutated) is a brushless, direct current, external rotor type of motor. In commutation electronics, an AC voltage is changed into a direct voltage by a commutator. The motor position is dependent upon voltage supplied via an inverter module (similar to the principle of a frequency inverter). The EC commutation electronics are different from a frequency inverter in that they decide how the motor phases in the stator are supplied with current (commutation) depending on position, rotation direction and default. Permanent magnets in the rotor produce a magnetic field which is required for full load production. A high efficiency, low noise, and continuous motor speed control is possible with this. An assembly flange on the rotor is used for impeller assembly. Depending on the motor type, a terminal box is available with cable screw connections or connection cable for easy and quick connection. Depending on the application area is possible to adopt further control functions (e.g. constant pressure control, volume flow control, temperature control). 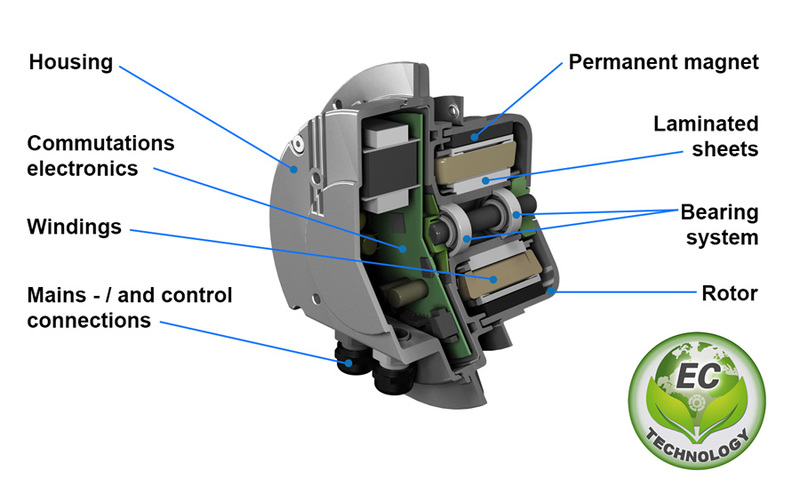 Conventional DC motors have a housing which contains all the assembly groups like carbon brushes, the collector, bearing, armature with winding, etc. They are arranged one after another. With the EC motor assembly, more space is saved and a collector and carbon brush are not necessary. Therefore the motor is significantly shorter and consequently has advantages with regard to dimensions when installing and quiet operation. The slightly higher investment costs for EC fans in comparison with conventional motors are mostly amortized within the shortest operation time because of the low energy consumption and lower installation costs (no transformer control, frequency inverter, or phased angle control is necessary).